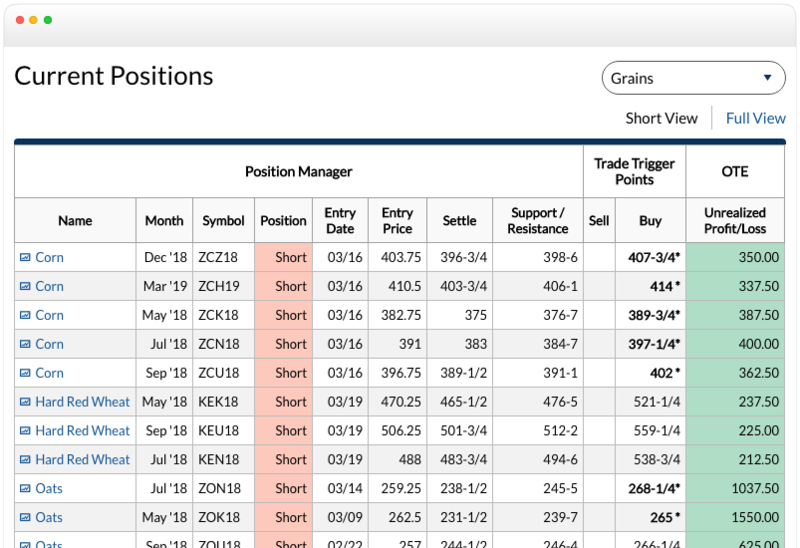 At the end of each trading day, our data servers identify buy, sell, and hold triggers in over 79 markets by carefully analyzing thousands of data points giving you professional-level trade recommendations. Truth be told, TrendTrader provides you with more valuable market timing information than you’re likely to receive from your broker in a lifetime, at the cost of just a few commissions per month. We cover the gamut, including Forex, Stock Indices, Interest Rates, Metals, Energies, Commodities, and Exchange Traded Funds (ETFs). Here’s the Trends in Futures story... and what it means for your trading success. Trends in Futures is the tried-and-true Futures and Forex Trading System that supports you with Daily Recommendations. In 1963, Barchart developed TrendTrader — a computerized trading system designed to remove the emotional human element from market forecasting. From the outset it yielded amazing results. But to further perfect its performance, over the years TrendTrader has been fine-tuned and re-calibrated against available historical data to keep it true to its original programming, while improving on its outcomes. Since TrendTrader’s introduction, imitators have devised countless trading programs, timing theories, and “sure-fire techniques.” These have been popularized by an even wider universe of individuals and companies for the purpose of “outsmarting” the futures, Forex, and stock markets. But these “Johnny-Come-Lately” methods have not stood the test of time. TrendTrader Has Been Working Like Clockwork for Over FIFTY (50) Years! Our TrendTrader computer algorithm (with tweaks and minor updates along the way) not only worked in 1963... but continues to crank out winning trends and profitable trades today! At the end of each trading day, our data servers carefully churn through the markets, analyze thousands of data points, and identify buy, sell, and hold triggers in over 79 markets. We cover the gamut, including Forex, Stock Indices, Interest Rates, Metals, Energies, Commodities, and Exchange Traded Funds (ETFs). We keep track of TrendTrader’s recommendations in the hypothetical Trends in Futures account, which typically holds tens of thousands of dollars in unrealized gains. You can see for yourself how well it all works because your membership allows you to sign in any time to review these recommendations. What Makes TrendTrader So Effective? In the uncertain world of futures trading, TrendTrader signals major trends whenever and wherever they occur based on our time-tested algorithms. It helps you discover, keep up with, and profit from the “monster trends” … and provides you with clear signals for how to navigate the markets. Truth be told… at the cost of just a few commissions per month, TrendTrader provides you with more valuable market timing information than you’re likely to receive from your broker in a lifetime. There is a reason why they give their advice out for free on the Internet, whereas our veteran market analyst using TrendTrader only provides his recommendations to his Trends in Futures Members. Take advantage of everything we provide for a full 30 days. Use the information to set up some real-money or paper trades. Watch as your knowledge and understanding increase exponentially...as your confidence goes through the roof...as you see yourself become a better trader.